No matter what weather throws our way, they stick around for years, reminding me every spring that it’s all going to be okay. My viburnums, including ‘Spring Bouquet’ do, too. So, about this pruning stuff that’s on all our minds. The viburnums need pruning, but I’ll wait until they finish flowering. The roses are going nuts already, like Mrs. Oakley Fisher (among many others). What to do about them? In two weeks, I’ll gather a vase of them all, and then start clipping. We really do want to shape our roses in February for form and height and to encourage new growth before the heat descends! My Turks caps are already pushing new leaves on stems I hadn’t cut back. I went ahead and cut them back last weekend. Even if we get a harsh freeze, it won’t hurt these tough natives. I cut back most of the zexmenias (Wedelia texana). One is still flowering (that’s microclimates for you! ), so I left it for the hungry wildlife who head for it on warm days. Even though I’m clipping back some chrysanthemums to their rosettes, I’m not pruning any with a bud or a flower. ‘Butterpat’ is just not giving up! Rules, rules, rules! I’ve learned that the only ruler is nature and we just have to pay attention. And get to know your own microclimates and your plants. But for some “cutting edge” information, check out this Texas A&M site. To illustrate how we can work with nature instead of against it, this week sustainable garden designer Adams Kirkpatrick of Sunflower Design meets with Tom. Get some of his strategies to deal with drought through easy, sustainable practices: water retention, the 7-layer forest in our own gardens, and how to conserve the critical duff layer. One strategy that Adams promotes is respect for the beneficial fungi in our soil. This week, John Dromgoole explains how to pump up mycorrhizal fungi that are working for us underground. Benefits: Enhanced plant efficiency to absorb water and nutrients, increased drought resistance, and increased pathogen resistance. Find out more about mycorrhizal fungi from Texas A&M. 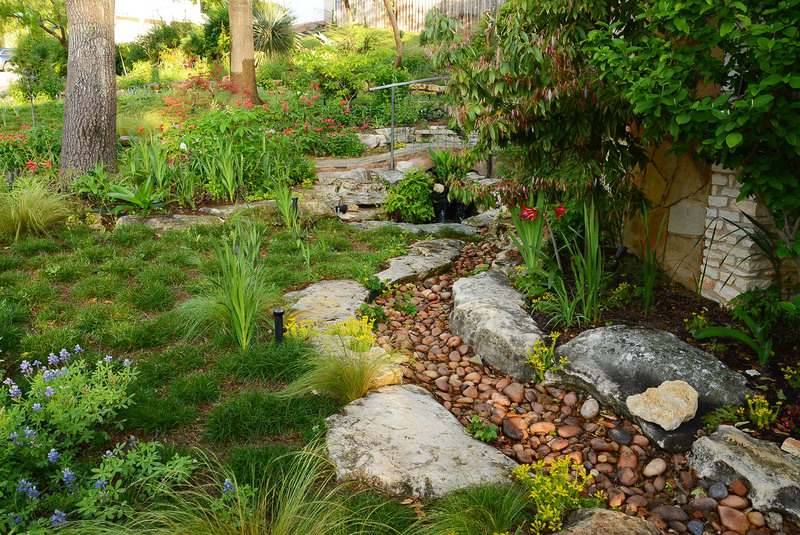 On tour in San Antonio, see how Don Clowe embraced these strategies as he removed lawn grass, merging his passion for plants and impressions from world travels with the natural conditions of his garden. On their tree house deck in front, he and wife Gail experience Japan in one view, and in another, the sculptural beauty of the Southwest. Especially significant is their dedication to beloved, departed family through stones of remembrance.